I went to the casino Saturday night in boy mode. My wife and sister had free tickets to see Styx and REO Speedwagon. I planned to play slots while they attended the concert. My wife and sister had an excellent time at the concert and I had an excellent time playing slots. In fact, it was the most productive time I ever had playing slots. I also had an excellent time girl-watching. Probably like many of you, I girl-watch to get inspired for when I am girl-dressed. Saturday night at the casino there were lots of ladies dressed to kill. There were larger groups of young ladies involved in wedding shower or bridesmaids outings, there were smaller groups of ladies having a girls' night out and finally, there were single ladies accompanied by males out for a Saturday night date. High heels, high hemlines, and a high fashion presentations were the norm. I wanted to go home and return dressed to kill myself! Instead, I went home and packed for my business trip this week. My packing included two new dresses and everything else I need to go out en femme after work during my trip. Funny how all my boy stuff takes up about one-quarter of the space in my suitcase, whereas my girl stuff fills the rest of the space and is crying out for even more space! 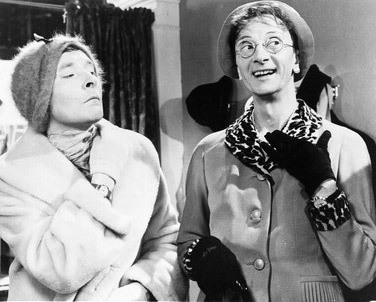 in the 1960 British film Carry On Constable. I loved your piece today about the casino. One of my favorite places to femulate is at or around casinos. Woman dress in all different ways and almost anything goes. I have played craps while dressed and slots. I have another trip scheduled to the Harrah's at Lake Tahoe in the middle of September. I find my self more comfortable in that environment than just about anything else and I can wear some clothes that might otherwise be a little overdressed around my home base. Thanks for the tips on "fashion watching locations" - I also like the Femulate Her photo today - I'm a sucker for leopard print! Grrrrr. I suggest a LBD for the casino. The other night at work, a lady in a long gown got the hem caught in the escalator. I saw it happen and hit the emergency stop. She was stuck good, and we could not pull it out and she was not willing to cut it. We had to bring in the repairman to unhinge the steps. She was freed up after 15-20 minutes and no worse for wear but all I could think of was, "That would never happen if she wore a miniskirt or LBD." You wrote: "I wanted to go home and return dressed to kill myself!" 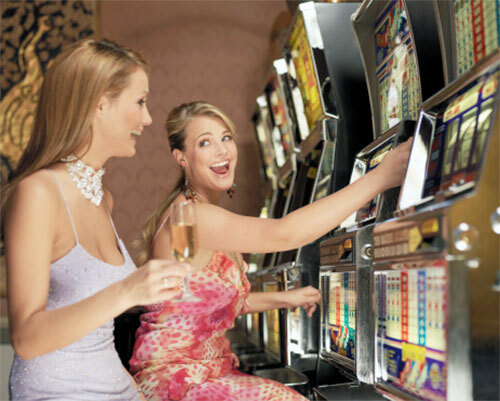 I overdress at casinos but I avoid my favourite ~ craps ~ because I'd have to raise my not-so-ladylike voice. I'm with yeah! several years ago and a relationship earlier, "the girls" did vagus! I can't tell you how fab that was. Dee and I have done it as well. But Dee is a little more reserved then the girl I was with on my first venture to a town where what is done stays in town. Your a great husband (wife) for respecting the wishes of your SO. 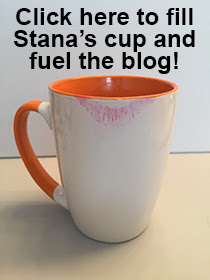 I only wish that she could share in the joys of you as Stana as much as we do.